Complete cafe table from the Florida range with a cast iron square base with a stepped design. Available for a quick delivery with a Black base and column. The Dolly cafe table is manufactured top order in Europe and is subject to a four week lead time. The distinctive curved leg design with a connecting ring is offered in chrome, polished aluminium or silver finish. 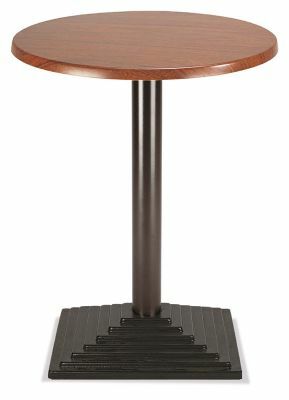 A durable café table frame suitable for regular commercial applications the Dolly café table is compatible with a number of café table tops up to a maximum size of 900mm diameter circular or 800mm x 800mm square There is a bistro chair and bar stool associated with this range of café tables.